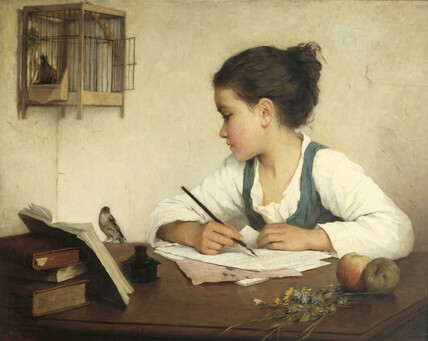 Love this painting of A Girl Writing by Henriette Browne. It was on the front of a birthday card I received in January from my dear friend, Jean. We were about this girl’s age when we met, in an English class, in sixth grade. Do you like to read longer posts or shorter ones? Do you read more blogs from your sidebar, your “Google” reader, or comments of blogs you’ve visited? I have my own answers to these two questions, but I’d be interested in your point of view before I reveal them. Let me know what you think, if you please. Next Post Long Posts? Short Posts? Google Reader or Sidebar? I like long posts although I'm not too bothered by the length. I find I'm increasingly reading blogs from my twitter feed but it's mainly from my Google reader and comments. The RSS reader is my first-pass machine.I like to read better posts, regardless of length. For badly written posts, shorter, please. Length is irrelevant. If the writing is good, I read. Or, if the post is intriguing, I enjoy. A photo and a haiku or a 3,000 word essay – it's the quality that counts.I also read comments – always. I enjoy the discussion.I keep an extensive list of blogs to read, with clickable links, and also subscribe by email. I don't use a reader any more because I found I was missing things. I pay almost no attention to sidebars. I don't care about length very much. If it's something I'm interested in, I'll read it and if not, I won't. I read from my Google Reader pretty much exclusively – well, also from my iPhone if I'm out. I only click through to the actual blog to comment and I don't always comment. I've had to cut down on the number of blogs that I subscribe to because I was just spending way too much time on the computer and not enough reading. I've also decided that I don't have to read every post from the blog I do subscribe to. I skim my way along and try to comment at least occasionally on all of them. When I have ample time, I prefer longer, in-depth blog posts and reviews. But I do not always have that luxury!I am old-fashioned in that I prefer to view blogs in their original form, rather than in a reader. In general, I prefer posts that are on the short side. I do most of my blog reading from Google Reader. Mostly I read blogs from my sidebar and the sidebars of other blogs. Only during book blogger hop or It's Monday I tend to read blogs I have not in my sidebar.For the length of a post I read those which already grab my interest in the headline or first paragraph no matter if short or long. I always read the comments then and often post one, too. Sometimes I check back to see if the blog owner has responded to my comment or not.I do not use Twitter or Facebook though. I read most blogs from my sidebar. I often don't read the comments of others as I don't want it to taint my opinion, if that makes any sense. If I don't know what to say, I do read the other comments. The length of the post I like to read depends on the writer. I don't mind long post when it's by a trusted blogger. But whether I read it in full or not depends whether the topic interests me and whether I have time for it at that moment. I read blogs using google reader, mostly on my iPhone. Don't know how I could manage without reader. I click out to visit the blog when I want to comment or read the comment thread. Google reader. Length doesn't matter – whether I read or not depends on whether the topic grabs me. I typically read shorter posts, and skim longer ones, unless they particularly pull me in. Time is definitely a factor! How I read also depends on my time: if I'm short on time, I read posts right in my Google Reader, but when I have more time, I use the "next" button in my toolbar so that I can see posts in their full context. I find seeing the whole page helps me better mentally link the post to the blogger. I like longer posts, but that are visablly broken up into easy to identify sections, so I can skim if needed… that said, I don't do this myself… haha I am happy to read a long post if it's interesting and grabs my attention, or if it's about a book I liked (or hated)… or one I want to read. It's all about the content :)I also read posts in my google reader. I don't comment as much as I should though. I should try and amend that. I prefer short to medium posts. I tend to save longer ones for 'later' but sometimes don't get back.I'm reading mostly from google reader these days. Length doesn't matter; I use Google reader to collate the posts I follow and then click through to comment when I feel so moved. Interesting questions. I read the blogs in my sidebar two or three times a week. I've never figured out Google reader. I follow links on other blogs on occasion and I do try to check out everyone who comments on my own blog now and then.We I see I have a new commentor, I check out their blog to see if it is something I'd like to visit regularly and add them to my sidebar.I prefer longer posts, as long as they are well written. I'll read short ones, but I like it when someone can get a good five or six paragraphs going. I'll read more than that, too. Oh I like long and short posts, length doesn't matter if it's an interesting book or topic! :)Usually I go to blogs from my GR and when someone new comments on my blog I pop over nd visit their blogs. Sometimes I 'meet' a new to me blogger on somone else's log who sounds super nice and interesting and then it's another blog for my GR :DAlso, that picture is so great and I love that you two are still friends! I enjoy long and short blog posts. Sometimes I just don't have time to read the long ones so I have to skim but I still enjoy them. I read 95% of my blogs from my Google Reader. This is the first time I've seen this painting and it's beautiful! The little girl is adorable, too…the painting is also very life-like.I don't have any Facebook or Twitter connections on my blog although I think I'm going to add a Twiiter button.I read blogs from my blogger list and my email subscriptions and also try to visit the blogs of any commenters I don't already know.I prefer reviews that are a little more in-depth because they tend to give more of a review of the book I've found. I love medium-sized posts. They're not too short or too long. I find reviews everywhere: Google Reader, Twitter, favorite blogs.. .
Will have to come back later to read all of the comments. Unfortunately I'm short on time all the time and so I am really selective these days about what posts I read. I gravitate towards the personal ones rather than the bookish ones and if bookish I prefer shorter or more pointed (though I realize my posts have gotten long and rambling). In terms of bloghopping, I use Google Reader mainly (sorted by fondness of the blog/ger). If really short on time then I'll pop by via comments. Sometimes neither of these happen. Honestly, though? I don't like the feeling when I can tell someone is searching my blog to leave a comment on a random post just because I left them a comment. I don't like blogging to feel forced! I don't think less of books (or the reviewer) if the review is a certain length. But if it is a long review with a lot of rambling, or a short review with only hints of how the reviewer felt, I feel cheated. If it's a short post, I will probably read it and comment right away. If it's a long post, I will bookmark it until I have a bit more time, then read and comment thoughtfully. I use Google Reader mainly. But if I'm intrigued enough by the post, I visit the blog to leave a comment. Shorter. I think a book review should be short and concise. After all, we're not being paid to do it!! I generally pick blogs up from my sidebar and favourites and comments and other blogs, too. I think my response to all the questions is yes, I check ouy those that enter the Parrishlantern via stats, via reader, via my sidebar and increasingly via twitter(quite often the way i find new blogs). As for length of post, thats totally down to my level of interest, keep me engaged & like the good puppy I am, I will follow. Interesting questions. I'm a short to medium reader – anythying long with no breaks will loose me. I really only have access to the sidebar and links online. I dont do google reader or twitter or iphone – one could say I'm old fashioned (if being a basic blogger can be old fashioned?). just reading the comments here raises interesting questions for me – should I twitter or something like that?? What attracts my attention is usually the post header – if that grabs me, I'll probably read the post. I'd be interested what you make of all these responses now? I've been in the hospital all week with my mother: Friday, Saturday and I'm going back now on Sunday as she has another procedure. But, I do want to compile the responses everyone has left here into some kind of order (that would be the teacher in me), as well as give my own opinions. Soon. When my mother is feeling strong again. My thoughts are with you. I hope all goes well, and that she's soon in good health. I know one of the 'tips' to increase your blog traffic is to keep it short. But I say, write as much as you need to. I enjoy both long and short posts. As with most things, quality counts more than quantity. Longer ones I usually would stop by several times to finish or re-read. No matter the length, I definitely like to visit a blog on its full site, not the mobile site. I'd like to see the whole design of the blog, all the sidebar items. BTW, I absolutely love this painting. I love that painting, and it reminds me I haven't posted a "Woman Reading" portrait in a while…As far as posts, I tend to like about a 500-750 word post…I don't really like reading on the computer, and my mouse finger gets itchy if the posts are too long.I generally go through my sidebar links first, and will then check out the blogs of any new people who have commented.In reading the comments, I see your mother is still unwell, so I'm hoping that a resolution to that situation is forthcoming this week. Holding good thoughts, and keeping you in my prayers. That is just a gorgeous image. Any image of books, someone reading, never fails to catch my attention. This one is just beautiful. I need to keep a collection of these images. I'm amazed at how well received this painting has been amongst my blogging friends. It struck me, of course, but I didn't know it would also strike a chord with so many of you. I toyed with putting it in my header, but it made the header far too large. Then, cropping it made it lose some of its charm. For me, anyway. So, it will remain at the bottom of my sidebar.As to your suggestion, Carl, I do think it's a lovely idea to keep a collection of the images we find that move us. Especially of readers and writers and books. You might not know it from the style of art I showcase at my site, but I do have a real passion for classic stuff like this. This one is extra special because of the reading connection. The books have a nice aged quality to them…they look well loved. I look at this and ache to know what books are there, wonder what the open book is revealing to her…and of course I love the bird. That whole animal/human companionship idea. Its just great. I've told you before, but I love your header images because of their age but also the reading aspect. What a lovely painting, perfect for my room. Thanks for giving me an idea for choosing what painting is the best.